H x W x D: 27.5 in. / 19 in. / 9.5 in. The sculpture shows a dramatic episode in the daily life of a trapper: his mounted descent on an almost vertical slope. Mountain Man and horse work together to make the trip down a treacherously rocky decline. The horse has been given full rein to choose its pace and path, the rider leaning sharply back and balancing himself by holding onto the tail strap with his right hand. The artist, Frederic Remington, was the son of an Army Colonel who fought in the Civil War. 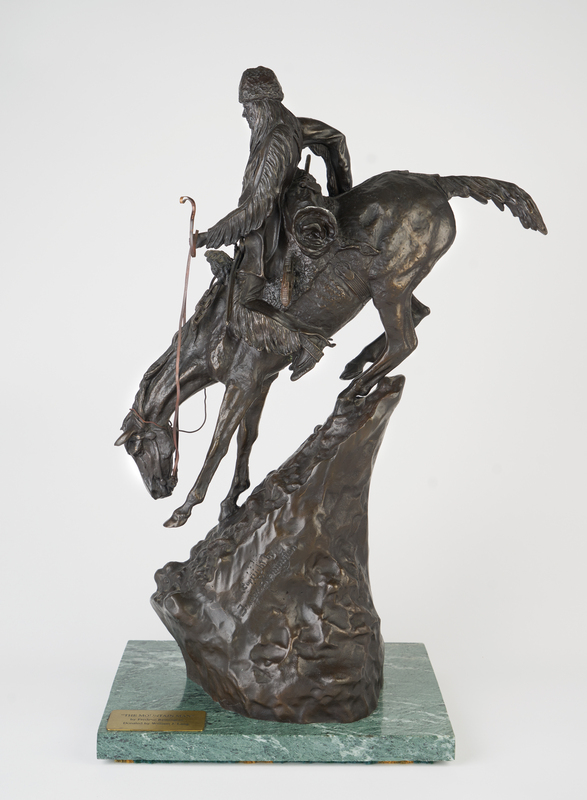 Remington bronzes are among the most widely reproduced of all metal sculptures. Some unauthorized copies of his work have been traced as far back as 1920. However, when the copyright protection of his work expired in the 1960s, the number of reproductions in the market increased exponentially.